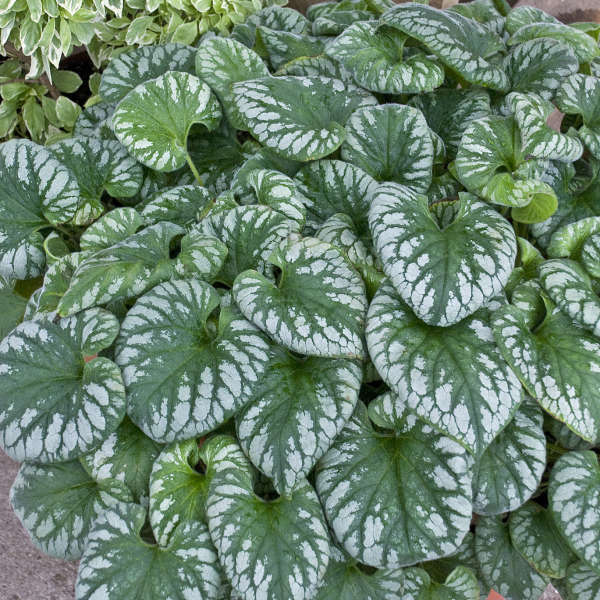 A number of excellent new forms of Brunnera have been introduced in recent years, and 'Emerald Mist' PP20460 is no exception. An obvious improvement over 'Langtrees', this new sport of 'Jack Frost' PP13859 has more silver barring with the bars connecting to form a silver collar around the perimeter of the leaf. 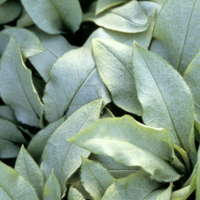 In addition, there is a very light dusting of silver over the entire leaf surface. 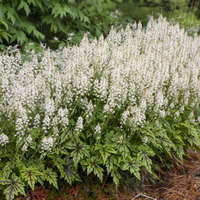 This variety produces the same tiny, baby blue, forget-me-not type flowers and had the same mounding habit as 'Langtrees'. 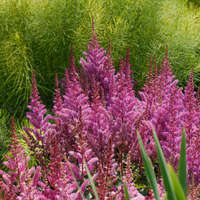 Brunneras are classic perennials that are treasured for their shade tolerance and lovely blooms. 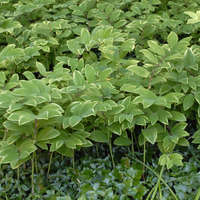 They make a fantastic groundcover, though the variegated forms may be slower to spread than the species. 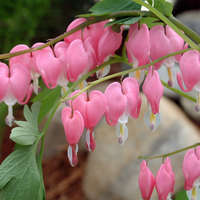 Try growing them in containers too so they will be close at hand when you want to snip a few blooms for a spring bouquet. 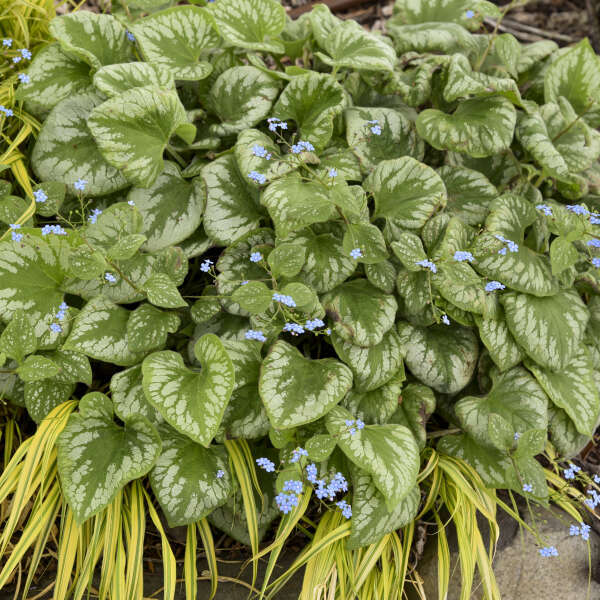 Brunnera is a woodland plant that should be grown in full shade and consistently moist soil in southern regions. In the north, morning sun is acceptable as long as the soil remains moist. 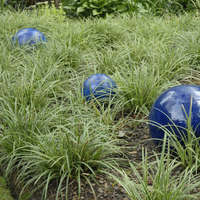 They will grow the fastest and strongest in rich soil. 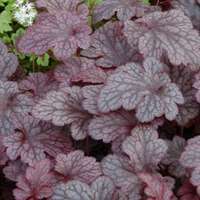 Little care is needed once Brunnera is established. 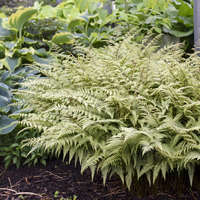 Cut back the old foliage in the spring rather than in the fall; it will help to protect the crown during the winter. 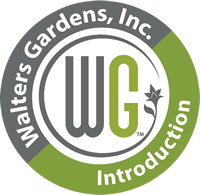 A winter mulch is also recommended. 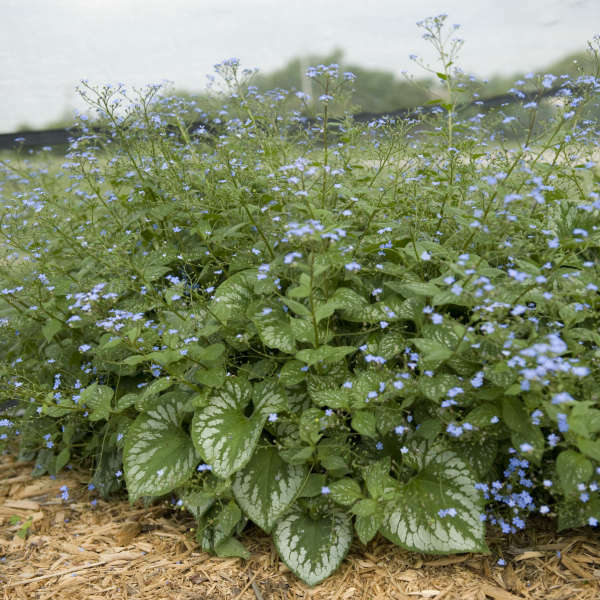 Though Brunnera tends to self-seed, the resulting seedlings are easy to pull out from unwanted areas or to replant elsewhere in the garden.